Biopics are lies. Oh, don’t get me wrong, all storytelling is fundamentally fibbing. But it seems somehow more disingenuous to airbrush actual human histories, to select which warts to ignore and which redemptive moments to exaggerate. Documentaries exist for a reason and, while they too require editing, at least the filmmaker has to show his work. This is a long way of saying what Straight Outta Compton has is quite good, but what it doesn’t have is a big problem. We’ll get there. This is the story of NWA, a group that exploded out of California in the 1980s and changed music (and culture) forever. At some point, Dr. Dre (Corey Hawkins) convinced Eazy-E (Jason Mitchell) to take money he made from dealing drugs and start a label called Ruthless. 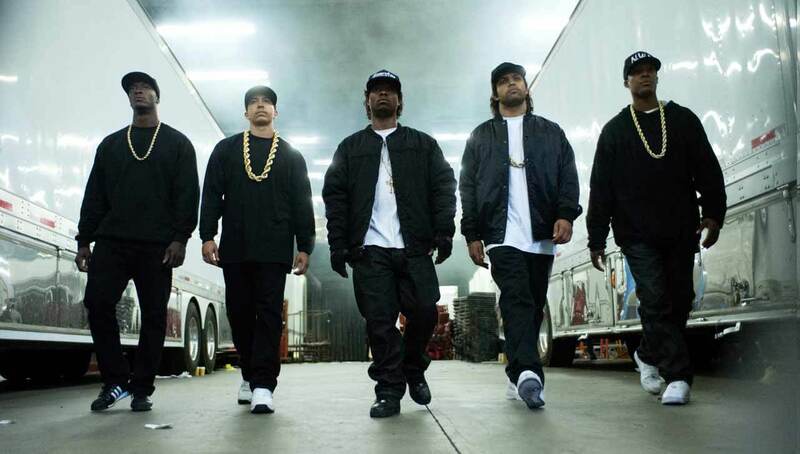 Dre snagged Ice Cube (O’Shea Jackson Jr.) to write the rhymes along with MC Ren (Aldis Hodge) and brought in DJ Yella (Neil Brown Jr.) and the D.O.C. (Marlon Yates Jr.) to help him in the studio. The group caught the attention of manager Jerry Heller (Paul Giamatti), who promised Ruthless’ owner, Eazy-E, that eternally Faustian deal of fame…with a price. In short order, the band was a phenomenon. What started in their neighborhood suddenly ballooned to coast-to-coast success, with sold-out shows and millions of records. But if you’ve ever watched a musical biopic (or seen any form of dramatic narrative), you know what comes next. Ice Cube bolts because Jerry screws him on his contract. Dre leaves for the same reason. Thus, arguably the best rap group in history made one album with all original participants before falling into a whirling maelstrom of feuds and disparate career choices. Director F. Gary Gray’s first half here is something special. Buoyed by the performances of Jackson and Hawkins, the film captures the soul of NWA: exceptional artistry filtered through anger at systemic racial inequality. But the innate flaw in the music biopic is the inescapable pattern: meteoric rise before heart-rending fall. The rise is great here, but the fall is underwhelming. Gray doesn’t invest his time well; giving Suge Knight (R. Marcos Taylor) so much space makes little sense when, in context, he is just a plot point and footnote in the history of NWA. But that’s not Straight Outta Compton’s big problem. Its big problem is the same one NWA had: women. Much has been made about the failure to include the infamous assault of journalist Dee Barnes by Dr. Dre. But it’s deeper than that. NWA had every right to tell the police what to do with themselves, but their treatment of women lyrically and physically was reprehensible. The catch 22 of a film like this is that the only way filmmakers get cooperation from the subjects is if they gloss things over, leave things out, exaggerate the positive. Lie. Had the real-life surviving NWA members been as brave now as they were when they started, it could have been redemptive honesty. Instead, what we get is a visually thrilling, musically electric rise of an important band, followed by a pillow-soft landing into trite cliché.